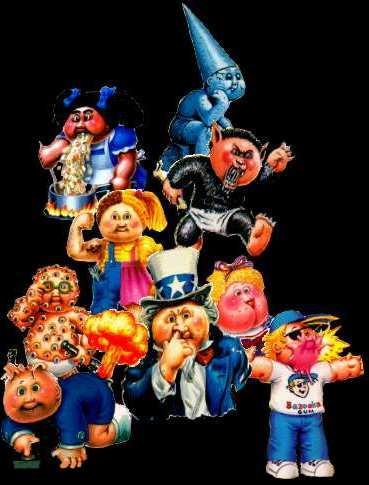 I've been collecting Garbage Pail Kids since 1986. I lived in Scotland then, so I was stuck with buying those tiny Ireland kind. Another downside to collecting GPK's in the UK was that they would only sell a new series by year. My parents were stationed there for 2 years, so I just got the 1st and 2nd series there, then when we moved back to the US, GPK's here were already on the 9th series. So I missed out on the 3rd-8th series and couldn't find any anywhere except sometimes on tables at school and some at flea markets. Heh, I still have a bunch of GPK's I scraped off some desks which are in these old photo albums I took all our family photos out of and just put in about 9 GPK's per page. I use to always dream about having the complete GPK collection when I was younger, and thanks to eBay, I do have them all. Sometimes I like to take them out and inhale them and line them up on the floor and just stare. I'm sure any real GPK enthusiast would understand. GPK God and all around cool guy, John Pound's site. The Garbage Pail Kids Archive. I'll find and put more links on later. 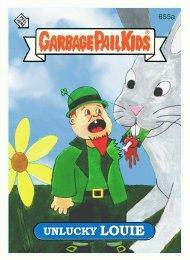 Make Your own Garbage Pail Kids. Topps may have put an end to the creation of GPK's, but with this section of the page I'll be posting people's home made GPK's. So if you have no friends, no job, but a nice computer or scanner, make some of your own GPK's. I'll also be including some stencils of GPK's eyes, heads, noses, mouths, puke, snot, etc, that you can download and just copy and paste onto some other picture or somethin. And if no one sends any gif's or jpg's in, I'll just make my own and post them. This original GPK was sent in from Hugh. Thanks Hugh, didn't think anyone visited my page but me. 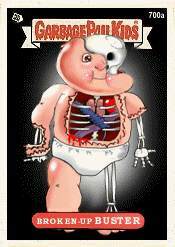 I added your (underconstruction) GPK page to my links. Randy told me this picture took him 5 hours on photoshop and he's working on more. Good job, heh. yea yea, I'll make some stencils this weekend. Thanks. Here's some stencils, I don't think they'll be much help though. This one goes on mom's fridge.